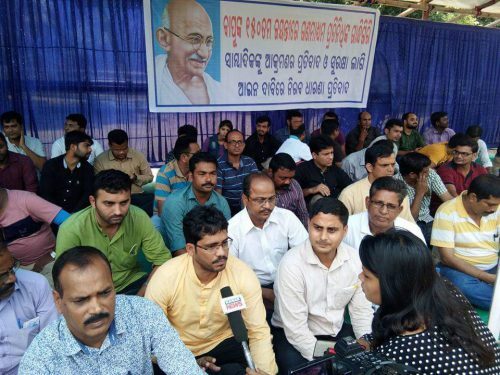 ONI Bureau: Over 200 journalists from Print, Television, Web as well as the freelancers upped the ante to protest against recent surge of attacks on Working Journalists in Odisha in the recent weeks as we are about to enter the election year. Senior Editors and Journalists condemned the attacks on Scribes and asked the State Govt to ensure their safety and security on a priority basis. The journalists expresses concerns over the vitiated atmosphere in the state and called for unity among mediapersons to fight the menace. For the first time in several years, the journalists in Odisha showed rare unity to stand for a common cause. They held silent protests from 9 AM to 5 PM at Lower PMG yesterday, demanding strong action against the accused, safety measures for the working journalists and government efforts to prevent such incidents. The Scribes also sought a new protection policy for the Journalists to deal with such incidents. It can be recalled that a BJD MLA and his supporters assaulted two journalists in Soro (Balasore) a few days ago. Both were hospitalized. In another incident, some miscreants assaulted a journalist in Baliapala (Balasore) and severed his fingers. In Puri, the police assaulted a group of journalists who were covering an incident.